Economist Dean Baker describes one effect of this in Minimum Wage: Who Decided Workers Should Fall Behind? 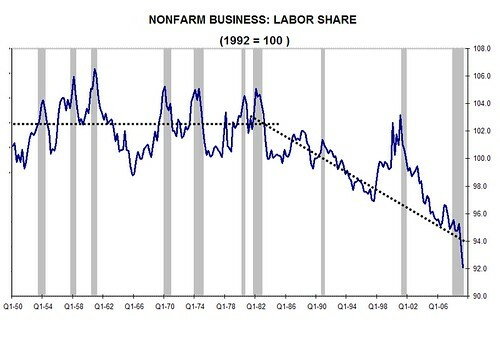 Baker is referring to this CEPR study: The Minimum Wage and Economic Growth. Read what Baker wrote again. The minimum wage would be $16.50 an hour — $33,000 a year — if it had kept up with the growth of productivity since 1968. To put the effect of this a different way, 40% of Americans now make less than the 1968 minimum wage, had the minimum wage kept pace with productivity gains. This is one more way to understand the effect of income and wealth inequality on each of us. The 1%/99% thing is real. When you hear that the 6 Walmart heirs have more wealth than 1/3 (or more) of all Americans combined, it is real. When you hear that the people on the Forbes list of the 400 wealthiest Americans have more wealth than half of all Americans combined, it is real. And the effects on the rest of us are real. Here is another relevant post: Tax Cuts Are Theft, explaining how cutting taxes on the rich siphons off public wealth. 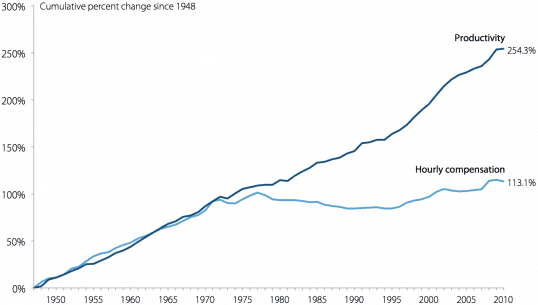 And of course this one: Reagan Revolution Home To Roost — In Charts. Yet another report is out showing how the trade deficit is costing us millions of jobs and hurting our economy. This report has specific numbers: between 2.2 million and 4.7 million U.S. jobs, between 1 percent and 2.1 percent of the unemployment rate and a gross domestic product increase of between 1.4 percent and 3.1 percent. These are real numbers that were carefully calculated. This is a real problem that is hurting people, hurting small and mid-sized companies, hurting communities, hurting our tax base and hurting our ability to make a living in the future. And there are real solutions available to fix the problem.